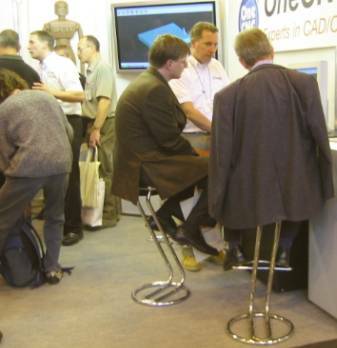 The MACH2004 19-22 April 2004 exhibition had over 400 exhibitors and 21,000 visitors occupied an impressive 25,500 m2 of space. Showing the very latest metalcutting and metalforming machine tools, CAD/CAM, metrology, tooling, software, automation, robotics, welding and metal fabrication equipment. Much of this equipment was on show for the very first time. 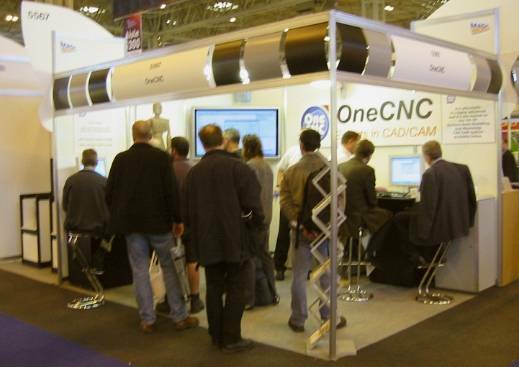 As well as being able to see a wealth of products and technologies, new initiatives introduced this year enabled visitors to hear, first-hand, about leading-edge technologies, at the free seminars organised by MTA and sponsored by Metalworking Production and of course the ability to see OneCNC products. 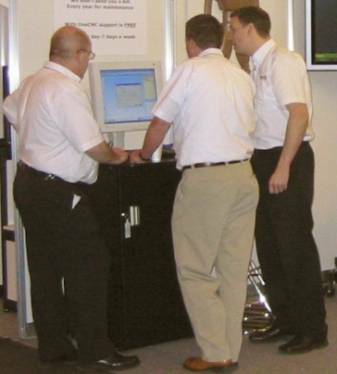 OneCNC UK exibited for the first time at the Mach2004 and was represnted by Neil OneCNC UK, Peter OneCNC UK, Uwe OneCNC Germany and Bob from OneCNC Australia. Second from right is Uwe OneCNC Germany demonstrating the new features of OneCNCXP being shown for the first time. This was the first MACH show for OneCNC UK which is sure to become a tradition from here. 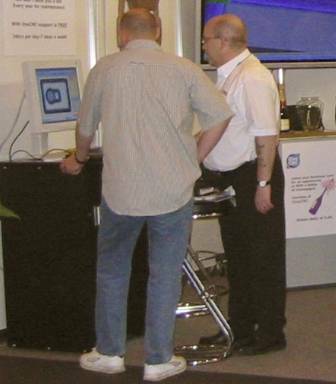 Here we see Peter OneCNC UK Technical director demonstrating the capabilities on OneCNCXP to a customer. Round table discussion with Peter OneCNC UK (left) Uwe OneCNC Germany and Neil OneCNC UK making sure they have no missed any of the new features being demonstrated.